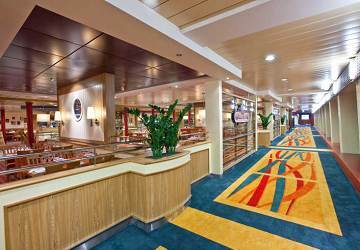 M/S Baltic Queen is one of the most modern ships in the Tallink Silva fleet with her maiden voyage taking place as recently as 2009. Onboard you’ll find she meets the high standards expected of a Tallink Silja ship including a large selection of luxury cabin accommodation, several restaurants, numerous bars, nightclubs, a shopping area, children’s play area, an excellent sauna department, a modern conference room and onboard entertainment. 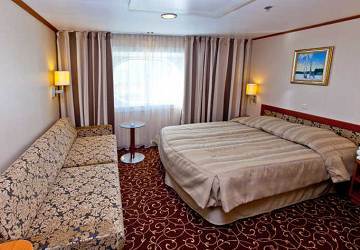 There are more than 900 cabins onboard ranging from spacious balcony suites to standard inside cabins. All cabins are en-suite with a TV and specially adapted cabins for disabled passengers and allergy-friendly cabins are also available. 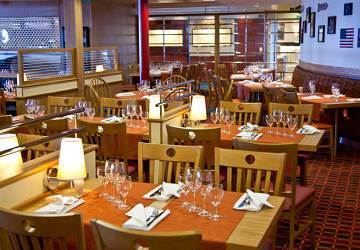 There are numerous places to eat onboard the Baltic Queen with something to satisfy every taste. At the à la carte ‘Gourmet’ restaurant you’ll enjoy the best flavours on the Baltic Sea whilst admiring the wonderful sea view. There is also a Russian à la carte restaurant ‘Katarina’ and the 266 seater ‘Grill House’. If you fancy a bit of everything then head to the Buffet for a rich variety of dishes enjoyed in front of a magnificent sea view or head to the cafeteria for light snacks. In terms of drinking venues, the Baltic Queen does not disappoint! The classy Martini Bar is a marvellous place to enjoy an aperitif while listening to a piano. The cosy Cigar Club takes you away from the stresses of everyday life with hefty lounge chairs, wide cigar selection and inviting decoration to enchant not only cigar lovers. 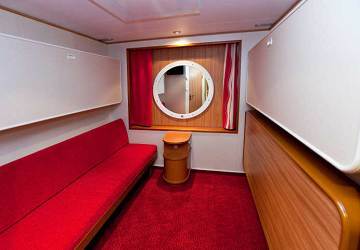 You’ll also find 2 pubs onboard – Sailors Pub and the Baltic Pub. Both feature a wide selection of drinks and a relaxing atmosphere. 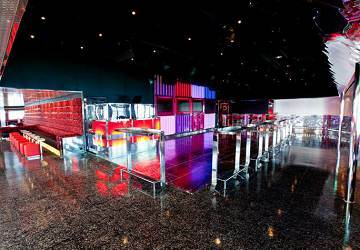 For entertainment, the Art Deco style Starlight night club provides magnificent surroundings with glamorously entertaining shows. In Disco Zenith passengers dance till dawn with the best hit music while in the bow of the ship Moonlight Dance Bar offers diverse selection of the best dance hits from the golden times of disco to modern day. On deck 6 of the Baltic Queen you’ll find a stylish shopping street where you can find international fashion, tastes and scents. 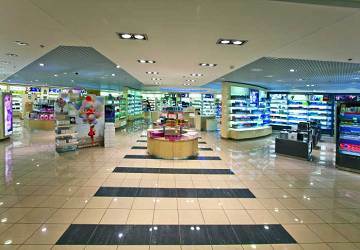 In the Cosmetic Boutique you’ll find the best known perfumes, cosmetics and skin care brands while in the shop you’ll find a selection of gifts, jewellery, clothes, toys, souvenirs, toiletries electronics and more. The Supermarket features a full selection of strong liquors, wines, beers, tobacco, sweets and food. The Baltic Queen is a classic cruise ferry where a lot of attention has been focused on providing entertainment to its passengers. 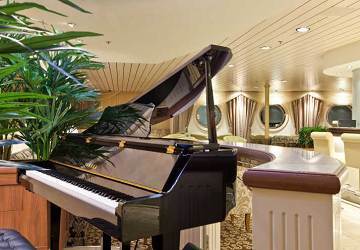 To make the whole trip even more glamorous and inspire your senses, the Baltic Princess also has ‘Show Time’. In the autumn spectacular comic performances intertwining humour, dancing and singing can be seen on the best cruise ships of the Baltic Sea. The unforgettable experience from these nights brings a long-lasting smile to your face. For some relaxation, the 2nd deck's sauna department makes a pleasant crossing even more enjoyable. The beautifully built sauna department has 2 private saunas, public saunas and pools for both children and adults. There are separate public saunas for men and women. 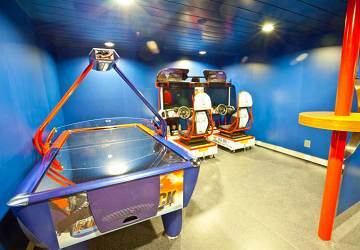 Baltic Queen is a ship capable of entertaining the whole family! 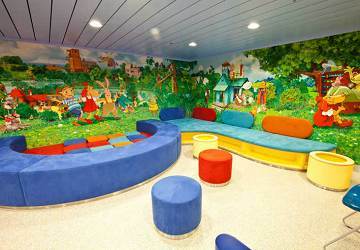 In addition to a children’s playroom and a PlayStation room, during school holidays Tallink put special programs together for children with specially trained staff on hand to make the experience as enjoyable as possible organizing all kinds of activities during the crossing. Please Note: Whilst we have taken great care in making our Baltic Queen guide as accurate as possible, onboard facilities, services and entertainment may vary depending on the date and time of year that you travel, facilities mentioned may change without notification and ferry companies reserve the right to operate vessels other than those mentioned at time of booking without prior notification. My trip from Tallinn to Helsinki and return with Direct Ferries was a real treat and very much added to the enjoyment of my day trip. It was all very comfortable and efficient and the fact there was a cabin for my return at the end of a long day was amazing - I had a shower then stretched out on the comfy bed. Many thanks. "Convenience, comfort and easy check in"
After a bicycle tour through the Baltic Capitals, we ended up in Tallinn and decided to take the ferry back to Helsinki. At the beginning of the trip, we opted to fly from Helsinki to Vilnius due to time constraints. The 3 ½ hour ferry ride was comfortable. We hadn't booked a cabin, so sat in the cafeteria at a table with a window. Food and beverage offers were good. Location of the terminal in Tallinn was very convenient to our hotel. The West Terminal in Helsinki offered tram #9 as a way to get downtown and from there to our lodging. "Great experience from start to finish!" Luxurious ship with everything you need. Very calm crossing and great value for money. "Very efficient, lots of amenities. " The ferry is very fast and the boarding is very efficient. Its obvious they do this route many times a day. Many options for food, supermarket etc. I was extremely tired on this ferry and could have done with lying down. Could have had a cinema sort of room. "It is nice and sure"
We had a good time. The ship is well equipped and there is almost every thing that you need. "Nice trip from Helsinki to Tallinn"
We took the ferry between Helsinki and Tallinn and it was a very pleasant trip. 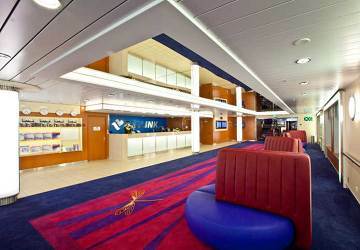 Friendly staff, nice and clean on the ferry, arrival and departure on time and good food. Absolutely a successful trip! Extra credits for the fast and easy booking system online and self check in at the ferry terminal. Very good ferry! The trip went quietly and nice. 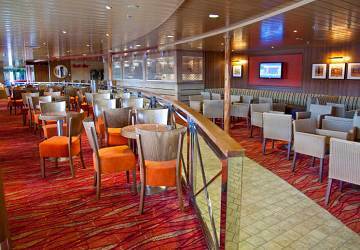 We enjoyed the crossing, there were plenty of places to eat, drink and sit and lots of onboard entertainment. More like a small cruise ship than a ferry! 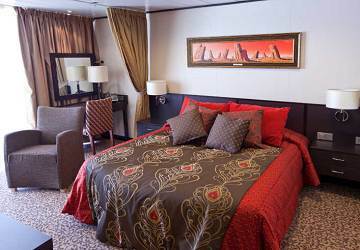 "Perfect Cruise : Baltic Queen"
It is ok for travelling on this cruise.We are enjoy for shopping,eating,relaxing with your coffe shop,pub....etc.Expectially on floor 6 & 7 .We hope to go this cruise in the future. "Helsinki or the ferries? Ferries. " Maybe it's that it was my first time ever taking a ferry somewhere. I enjoyed it more than Helsinki itself. Thank you very much! this was the best choice and i would recommend to everyone to visit both tallinn and helsinki. It is easy, affordable and worth of visit. 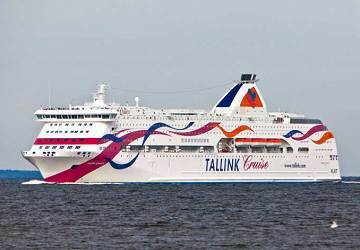 The distance between Tallin and Helsinki is just 80km , the trip is short and we travelled with the deck space. To Helsinki we traveled with the ferry Super Star 2 hours. The trip was very nice. Unfortunately for the way back we travelled with Baltic Queen 3.5h , that ferry is just for fun. There is a night club , cabins, and the reastaurant. 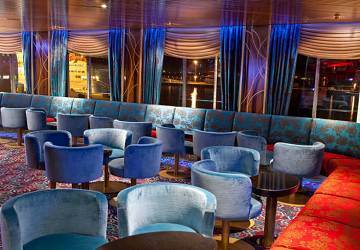 There is nto a Deck space just a few sofas. The ferry was full of people who just wanted to have fun (90%). For people who bought the trip with the Deck Space it is not so comfortable. Impossible to get to the restaurant and to the shop. It was busy as in Oxford Street in London . However are only 3.5h?! 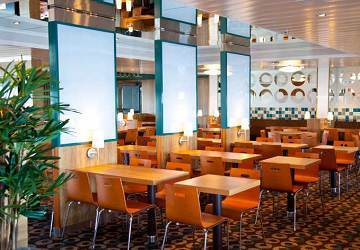 I recommend Talink Silja. 3 hours travel was really pleasure. We had a fabulous trip from Tallinn to Stockholm. This was in part due to an upgrade tp premier class, but I am sure we would have enjoyed the trip in any case. Why? A big part was the ship, herself. she appeared to glide soundlessly across the Baltic. From our room we had a fabulous view out over the bow of the ship through a huge picture window-like porthole. After a delicious dinner in the a la carte restayrant(after our complimentary champagne)' we went happily to sleep. When we woke in the morning and raised the blind there we were in the archipelago approaching Stockholm! What a way to wake up. This trip was one of the highlights of our European adventure.